Having a mental illness like anxiety can be tiresome. If you’re anything like me, your mind is on overdrive 24/7. Which can lead to some sleepless nights, my bags under my eyes are starting to get their own bags and extend up the side of my nose creeping towards to the top of my eyes. It’s sad really. I honestly need some sleep. Maybe just one day, all day. I once slept 13 hours. I was 15. My mom was really worried. But I was just tired. 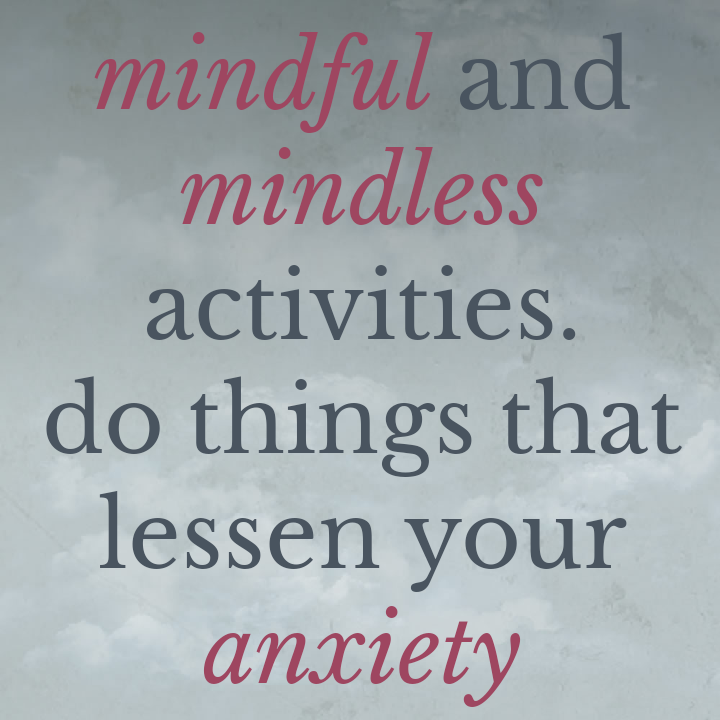 So, for your health’s sake, it is important that you find mindful and mindless activities. This means to do things that lessen your anxiety. I can’t remember where I read that coloring is a great activity to reduce anxiety and stress, but it does. I mean if you can focus on it long enough. Or if you’re like me, you try to color but have 2 kids who love to be glued to you. So much so that you have to wait til nap time or any other time they’re otherwise distracted to do anything on the computer. There are a number of things that you could do before an attack that could prevent one. Grounding exercise, meditation, anything. I read once that laying on your back with your feet up on the wall is great for many things. You can do leg exercises without squats, relieve stress, relieve migraines and I found it to be great at calming the body down. It looks weird but if it works it works. You should give it a try and let me know what you think.